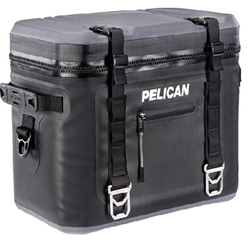 The Pelican Elite Soft Cooler is ready for your outdoor adventures and is a convenient and lightweight alternative to the traditional hard coolers. This 24 can soft cooler is easy to handle while being durable, waterproof, leak proof and can keep ice for up to 48 hours. It also comes with quick access buckles, stainless steel tie downs and bottle openers. This cooler will be perfect for outdoor events where a smaller more portable cooler will be beneficial to keep your items cool.